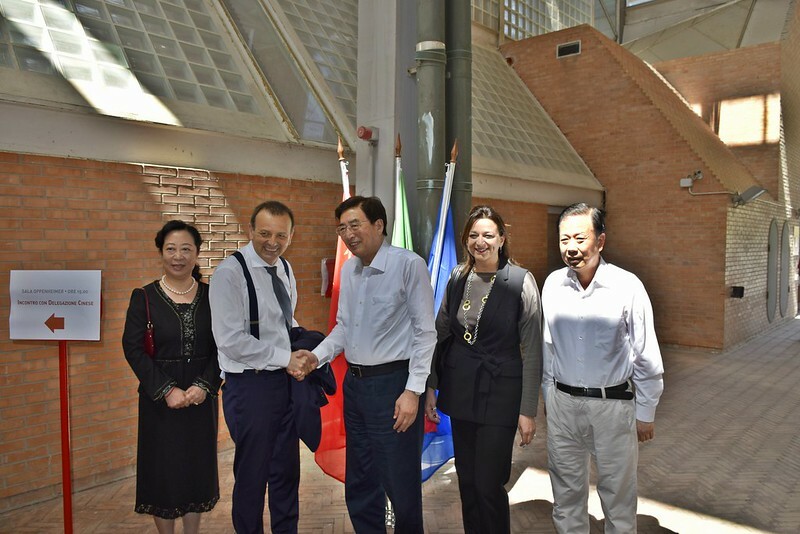 Last Saturday, June 18th 2016 the Chinese delegation headed by Guo Jinlong, Member of the Political Bureau of the Communist Party of China and Secretary of the Beijing Municipal Committee of the CPC, visited Città della Scienza together with Chen Fengxiang, Vice Minister of the International Department of the CPC Central Committee Zhang Gong, Member of the Standing Committee, Secretary-General of the CPC Beijing Municipal Committee and Vice Mayor of Beijing and Yan AoShuang, Director-General of the Beijing Municipal Science and Technology Commission. This important event was attended by the Ambassador of the People’s Republic of China in Italy Li Ruiyu as well as the CEO of Città della Scienza Vincenzo Lipardi, the Vice President of the Campania Region Fulvio Bonavitacola, the Regional Minister for Internationalization, Startups and Innovation Valeria Fascione, Councilor of Cooperation on Science and International Cooperation Unit of the Ministry of Foreign Affairs Filippo Nicosia and the two rectors Gaetano Manfredi and Elda Morlicchio representing respectively the University of Naples Federico II and the University of Naples L’Orientale. Afterwards the initial greetings, the Italian and Chinese representatives discussed the current state of the Sino-Italian cooperation in the scientific and technological field, focusing on the crucial role of innovation in the current consolidation phase of the Chinese growth and therefore its potential related to the expansion of strategic cooperation between the two countries on these issues. In this framework, the imminent Italy-China Science, Technology & Innovation Week represents a precious opportunity: it will take place from October 25th to 27th, 2016 in Bergamo, Bologna and Naples, where Italian entrepreneurships, researchers and academics can meet the Chinese counterparts. The Chinese delegation visited the spaces of Città della Scienza: the BIC Business Innovation Centre (particularly, some innovative start-ups including Torus Ltd and Techno Inn), Casa Cina, where the International Technology Transfer Centre is headquartered, and finally the D.RE.A.M. – Digital and Research in Advanced Manufacturing FabLab, where the delegation saw the mode of operation of the anthropomorphic arms used for the digital and robotic manufacturing.